Primary school children create their own Augmented Reality (AR) content! Our exclusive program introduces students to the 'magic' of Augmented Reality (AR) taking real-world items and enhancing them with computer generated imagery. They make their content 3D and even 4D with the help of avatars, 3D models, animations and their own creativity. This powerful technology allows students to create and publish their own Augmented Reality content. Students will develop their knowledge of Augmented Reality bringing the static world to life and creating content-rich interactive experiences. Talking newspapers, holding a NASA spacecraft in their hands and bringing lip syncing avatars to life will become their new augmented reality. Looking for more interesting uses for your school iPads or android tablets? This exciting and unusual class is a great way to get more value from your school tablets. Children become digital creators using a range of apps to create their own Augmented Reality (AR) content and exploring other commercial applications. This class can be run on iPads or android tablets - it is not available on desktop/laptop PCs. After class, friends and family can download the free app and experience the students' interactive, engaging content come to life! Intrigued to see how AR works? Download the Aurasma app* now and point your mobile device (android or iOS) at the image of Iron Man on the right. Seeing is believing! *Search for ‘Aurasma’ on the app store or on Google Play. 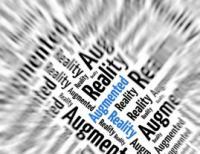 **Augmented Reality: an enhanced version of a physical, real-world environment created by the use of technology to overlay computer-generated sensory input such as sound, video, graphics on an image of something being viewed through a device such as a smartphone/tablet camera.